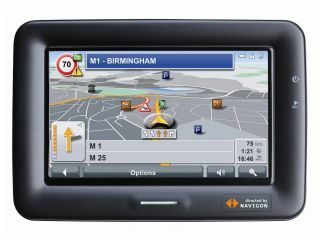 Sat-nav developer Navigon showed off its Navigon Mobile Navigator 6 software at a London briefing today. New features include a lane assistant, which helps drivers to select the correct lane at busy junctions; free traffic monitoring; and the choice of the most fuel-saving, quickest, shortest, or even scenic, route. Maps of 37 countries are included in the software, which is available on personal navigation assistants, PDAs, Symbian S60 smartphones, and mobile phones running Windows Mobile. Guidance on local driving laws, such as speed restrictions and alcohol limits, is displayed when entering another country. Navigon has also updated its points of interest (POI) database to include petrol stations, car parks, supermarkets, and public toilets. Drivers can even filter POIs according to brand name - handy if they hold loyalty cards at particular petrol stations, for example. POI listings now include web addresses, phone numbers and even sounds. "Navigation is no longer just about getting from A to B; it's now about the experience you have in getting to your destination and the value it adds when you get there," Andreas Westhoff, chief sales officer at Navigon, said. "When you take a device out of the car, put it in your pocket and find your way comfortably around an unfamiliar city, then you're having a much more satisfying experience than an ordinary driver. With points of interest, hotel, restaurant and sightseeing recommendations, satellite navigation devices can provide richness beyond that of a guidebook," Westhoff added.